Updating to Yosemite has provided some interesting issues for me. The first was Safari pretty much becoming unusable. It took a Mac expert and a chunk of his time to resolve the issue. There are still hiccups in other apps. I thought I would revisit some of the methods I have mentioned as usable in knit charting on Mac via a bit of discussion on cables and visualizing them. 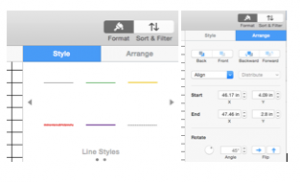 Intwined began having issues in Macs with any custom built stitch libraries in mid year 2013. The last update offered and installed September 2013 has continued to have some functionality issues in later Mac OS versions (Mavericks, and now Yosemite), stripped of any custom stitches built previously, not allowing for their addition. It has become only an occasional go to for me now. Charts created in the program are easily recognizable. 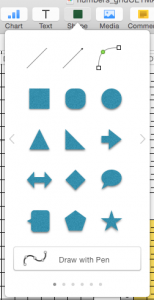 Inkscape (recommended for creating icons for use in Intwined, a free vector program) will require a XQuartz update for Yosemite. Their previous release allowed for its use in Mavericks. Mac Number has once again deleted some familiar menu options, added new ones. GIMP 2.8.4 (2.8.8 did not), HyperDither, appear functional as in past. 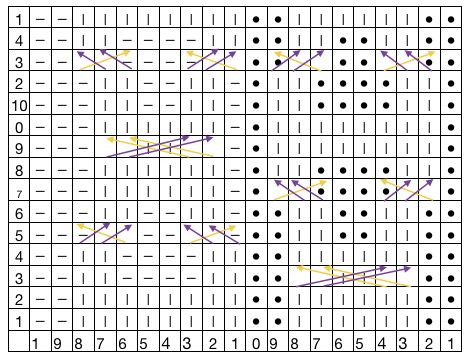 Tracking and visualizing custom cables outside the parameters of built in libraries or fonts/symbols in alternative software, using Numbers 3.5: one of the problems that can be encountered in charting cables is that programs with built in stitch libraries may not provide for cable crossings specific to your pattern. The charts below have not been proofed executable in a swatch at this point in time, are simply a way of exploring drawing methods, my working notes from some quick experiments, not a step by step tutorial. I have no way of confirming results in previous versions of the software or OS. 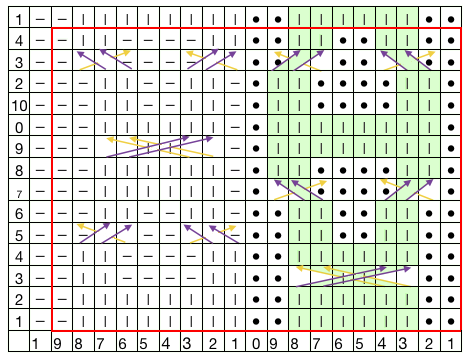 The knit and purl symbols on the left of my first chart utilizing line with arrow shapes are standard ones. The right side uses a dot for purl stitches instead of a line, and that began to make the whole more readable to me. One drawback is “shapes” do not seem to respond to any copy and paste demands and I had to draw each individually. I preferred to place them outside my chart. Guidelines then appear to suit for easy re sizing and the resulting edit may then be dragged and dropped into appropriate location in chart, readjusted as/if needed. Color palettes for drawing appear limited to the built in shades; toggling between available colors may be accessed by clicking on the dots below the pen tool in the first illustration above. In the chart, purple lines indicate stitches brought forward, yellow the stitches brought to back when working the cables. The number 10 in the left hand column should be a one. 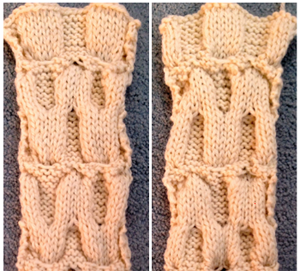 A lot of information is available on creating reversible cable fabrics using ribbed configurations. I thought I would play with knit/ purl blocks rather than vertical rib lines. 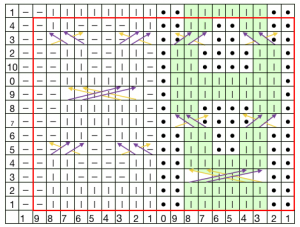 The initial chart was begun in Intwined, bucket filled in Photoshop to extend colors within cable crosses. The red border outlines the pattern repeat. 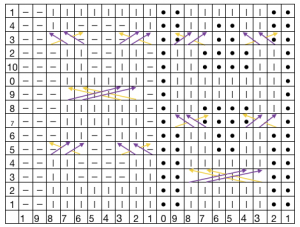 Alternate right side rows are shown; all wrong side rows are worked as the stitches appear (knit stitches are knit, and purl stitches are purled). Here the cell colors happen to be reversed from their use in the above, the yellow is used for knit stitches, the green the purls. 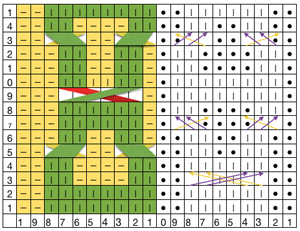 I opted to indicate knit stitches by color only, no symbol. This is the resulting swatch, in a random acrylic yarn, with varying numbers of rows in between cable crossings my plan is to create a scarf in significantly thicker alpaca yarn, a strictly HK fabric. Photo shows both sides of fabric.